I have my dairy goat. Not in milk yet, but she will be my milking doe come spring. I was surprised that I found a dairy goat this time of year, because dairy breeds haven't seemed widely available in our area recently. There were some earlier in the spring, but the only goats I've seen for sale lately have been Boers, Pygmies, and their crosses. Dairy does that do show up are usually very expensive (even mixed breed) and go quickly. I'm a little surprised that she's a Nubian, because I thought I decided against Nubians, as I mentioned in my earlier musings about getting goats. Two things changed my mind. Firstly, milk. Over and over I've read that folks prefer Nubian milk, or even milk from Nubian crosses. I used to enjoy Toggenburg milk, which some people find not so tasty, so personally I wasn't as concerned about flavor, as long as they weren't kept near bucks or didn't eat certain things. However for Dan, this will be his introduction to goat milk, so liking it is very important. Not that we drink milk, but we eat a lot of yogurt and cheese. But why the expense of a registered Nubian doe? I surprised myself with that decision as well, and this is the second reason I bought a Nubian. Not specifically that she is Nubian, but I've considered that the breed for us might be Kinders. These are a small, dual purpose goat which seem perfect for homesteaders like us. Unfortunately this breed seems nearly nonexistent in my part of the country, and I'm not going to transport goats for 100s of miles from another state. The other possibility is to start my own herd, which would require a registered Nubian doe, to eventually be bred to a registered Pygmy buck. Whether or not this will actually work out remains to be seen, but at least I have my doe. I was also surprised when the seller told me she may have been bred. Seems her younger half brother was left in with the ladies a little too long, that is, until after he was old enough to do the man thing. 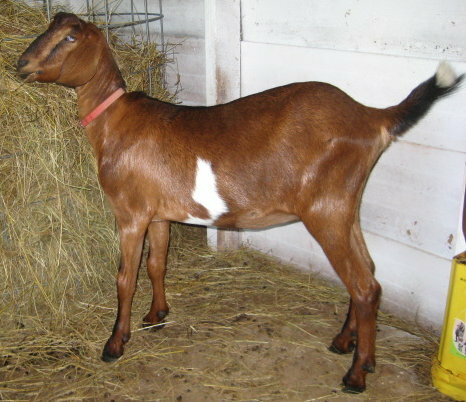 (Bucklings are sexually functional at 2 months of age.) If that's the case she could freshen in November, which I'm really not keen on. My mental time frame doesn't have kids and milking until next year. Hopefully she's not pregnant and I can have her bred on our schedule. Now comes the adjustment period of introducing a new goat, and the establishment of Surprise's place in the caprine order of things on the homestead. Hopefully that will go well. She so cute!!! I'm happy you got your dairy goat. I bet you can't wait til she starts milking (I hope that's the right term) so you can get some cheese. She is adorable...so cute...can't wait til you start making cheese!!! YUM! Congrats on the new addition!! She is adoable! You'll have to keep us informed on the whole milking process - sounds interesting. I've never had goat milk, nor have I ever milked a goat! warning: a friend of mine got a goat that may have been bread and it turned out that she was just getting fat. LOL! The previous owner just let his animals do whatever...if he got more animals he sold them. Your goat is a cutie though. I hope she becomes the mother of nations... perhaps she could be renamed Sarah. Now that's a good looking goat! We don't have goats any longer but used to have a small herd of milkers and a couple of bucks. I've always thought Nubians were my favorite . . . I just like the looks of them. Hope Surprise proves to be all you hope for. 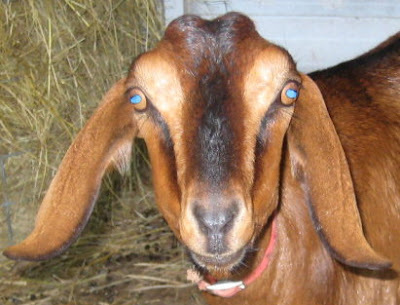 She is a very pretty goat - her coloring is such a lovely brown. Half-brother breeding her, huh? Well, that ought to be interesting. I agree, I hope she has not been bred. Awww.. Adorable! How I miss the rural lifestyle. What book do you recommend for a beginner? Renee, Abigail looks like she's getting fat, but her seller never mentioned a possible breeding, so I'm going to assume it's all those good field weeds! Mama Pea, did you milk them all by hand? I always thought one was plenty. I can't imagine having to milk a small herd. Benita, I saw her half-brother, gorgeous spotted coloring. There is a genetic problem with Nubians called G-6-S, but from what I've read it would take a lot of inbreeding to pull out the traits. 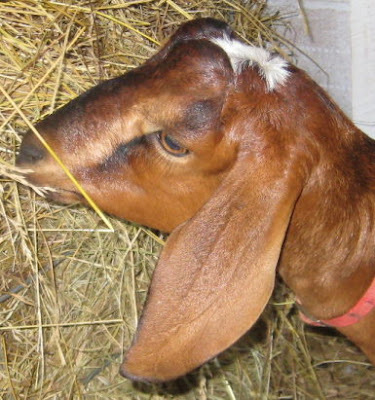 Surprise's previous owner did breed her goats, but followed a deliberate plan. Not sure how there could be an "accident," but I reckon the best laid plans and all that. Jill, I missed it when I moved away from it too. Thanks for visiting and taking the time to comment! oldestates, do you mean for goats? I'm finding Storey's Guide to Raising Dairy Goats to be the best so far. Check and see if your public library has a copy. Thanks for visiting! What a lovely goat! Congrats on your Surprise. I've found goats to be pretty easy on intros, they are herd animals after all and if I remember correctly no one has horns. Hi, Leigh - Yes, we did milk by hand. The most does we had in milk at once were five but it really didn't take that long. My husband was a teacher at the time so when school was out he milked in the a.m. and I milked in the p.m. When he was in school I milked both times a day. I never minded it ('cept when it was really frigid in the winter!) because it was my quiet, down time . . . just me and the girls with time for thinking and slowing down. She's so cute!!!!! Nice addition to the farm. We only had agora goats when we had animals. Theresa, so far things haven't gone all that well. Abigail is being very territorial and chasing Surprise away from the food and goat stall. I think in part this is because of Baby, whom she is protecting. Baby however, is curious and wants to make friends. Surprise is miserable and probably wonders what she is doing here. She cries all day long poor thing. The concern about putting them in the closed stall is that Abigail has horns and does go after Surprise. Today Dan built a separator so that the goats can be together but have their own space. Hopefully things will improve soon. Mama Pea, that's quite a few but quicker than cows! I need to look for a milking pail actually, and make a milking stand. More things for the to-do list. Hi - I've had a few people say we should get goats. Looking at her, I can see why! She's beautiful. I'll have a think about it, then think some more! Daharja, I've had a lot of people tell me I should get sheep. :) Like you, I'll just have to think about it! Oh, congrats! I hope the other goats accept her soon; poor girl!